Not quite as exciting as the title suggests. We can hope for real rarities but we are not going to get them. 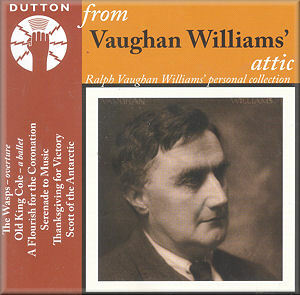 RVW was given many recordings of his own music but poor playing equipment and the ravages wrought by time, moves and poor damp storage has made much of this esoterica beyond commercial rescue. Sad! Instead we are treated here to tracks which have their own value and fascination but most of which have previously been issued by Pearl, Symposium or EMI. The exception, which I know from a private tape, is the 13 minute Beecham-conducted A Flourish for a Coronation. A zesty overture to The Wasps and the Old King Cole tracks are the earliest examples - acoustic process. They are also the only recordings here to be conducted by the composer. The Aeolian Orchestra was specially formed for the Vocalion series. The same orchestra also recorded McEwen's Solway Symphony which was once issued by Pearl on a limited circulation LP. It was re-recorded by Chandos for their superb modern McEwen series in the early 1990s. Old King Cole can be counted in the company of Holst’s Morning of the Year - examples of music written to accommodate community folk-dancing which had become a fad in the 1920s. A Flourish was written, like Walton’s Te Deum, for the 1937 Coronation. This is dynamic and celebratory RVW and well worth the discovery. The Serenade is very well known indeed having been reissued time after time. Always good to hear again. Thanksgiving for Victory was commissioned well before VE Day ready to be used when the then inevitable victory came about. The piece is familiar from a commercial issue in which there is a different orator (Robert Speaight rather than Valentine Dyall) which has appeared on EMI Classics before now with the Sixth Symphony. It can also be heard on another Dutton disc. There’s also another modern Hyperion version in which Gielgud is the speaker. The Scott of the Antarctic film music is represented by seven movements. This particular recording has appeared several times on Pearl CDs (review; review). These recordings are documents of three decades of audio-technical history. Two of them are from broadcaster acetates not originally intended for commercial issue; A Flourish and Thanksgiving for Victory. Many of these will be familiar from previous anthologies but this collection has never appeared together before. The note is by that ambassadorial authority of the British musical renaissance, Lewis Foreman. He always brings a new and stimulating twist to the subject. Pity though about the typo on Vocalion.